This week sucked. After the political thing that happened on Tuesday I didn’t feel very motivated to post anything about food anyway. Sorry, Vegan MoFo! Then F and I also got sick. But I guess we all still need stuff to cheer us up, right? And why not use some colourful food for that? 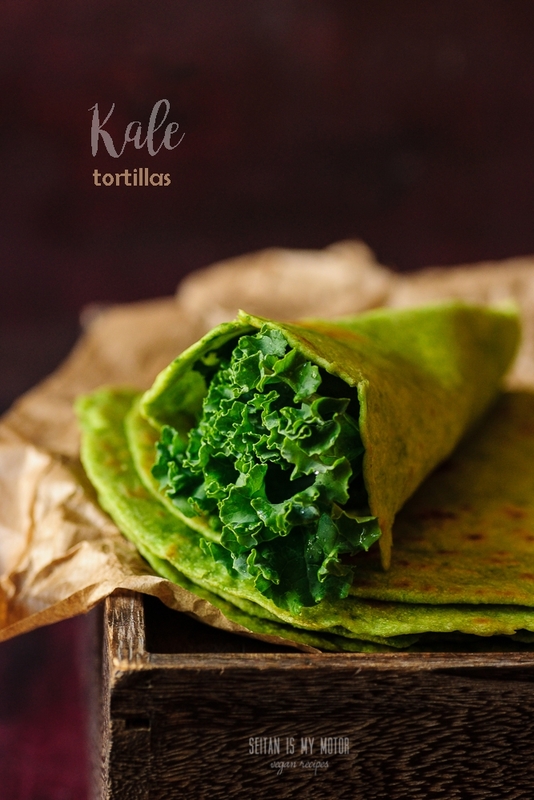 Like these kale tortillas which I made a couple of weeks ago. The original recipe for these is by one of my favourite cookbook authors: Terry Hope Romero. In her book Viva Vegan! there is a flour tortilla recipe that I have been making for years. 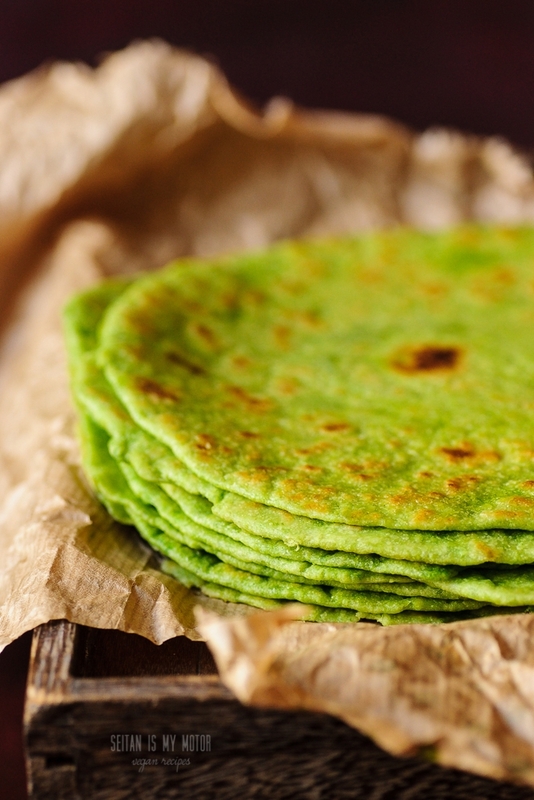 It’s such a simple recipe and the tortillas always come out perfectly pliable and tasty. Over the last few years I made many different variations and my latest one included kale pulp. Yes, that is right. I juiced some kale. We Germans have a very traditional relationship with kale. To most it is a boring winter vegetable. In Northern Germany it is an important winter staple. Cooked in fat and served with potatoes and sausage or meat it makes a filling and tasty meal. (Veganising it is a breeze, especially with all the tofu and seitan sausages around these days.) I used to eat this a lot when I was a kid. And everyone always told me that kale had to be cooked for at least an hour to be digestible. Ha! A few years ago it completely blew my mind that you don’t have to cook kale for that long to make it edible. This discovery has made this vegetable much more versatile for me. At work this green has been popping up since late summer, which is very unusual. Here kale is often not harvested before the first frost, because freezing makes it sweeter. Or at least that is what my parents and grandparents used to say. And look what I also found. Purple kale. So weird. After all the German name for kale is Grünkohl (green cabbage). But since we also have purple kohlrabi and purple carrots, why not? With its tough skin and chewy texture this green (ha) is really great for wintery recipes such as warming stews and traditionally meat and potato dishes. Putting it in a salad or a smoothie? Nah, that is not gonna happen for most people. Every year when kale season starts, I get very exited. And I tend to buy all the kale. At first it took me some time to get accustomed of the texture and taste of fresh kale that is only briefly cooked. When we used to make kale dishes at home, we often bought the chopped and frozen kind and then as I already said, cooked it for a good amount of time. Now I love kale stir fries or I use some thinly sliced leaves in my tomato sauce. And my daughter loves her monster juice, which is a smoothie made with lots of fruit and one or two small kale leaves. For one of our last smoothies I experimented a bit and suddenly found myself juicing the kale. Juicing is something I have never really liked. I think it is weird. Why would you do this instead of making a smoothie? You have to throw half of your produce away. Since that really bothered me I came up with methods to put the pulp in my bread. I made rolls and loaves and then transitioned to tortillas. You’ve got to use your hands to press out as much liquid as possible. In the end you should have about 30 – 50 grams of pulp left. That is what we’re gonna use for our flour tortillas. As for the juice, you can drink it if you like a strong cabbage taste. Or you can mix it with other juices, add it to your smoothies, etc. The tortillas came out just as awesome as the regular version. I had to use less water than the recipe originally called for (1/3 instead of 2/3 cup). But that might be different for you, depending on the flour you use. I used yellow wheat flour, which does absorb less water than regular all purpose flour. (When I made this with whole wheat flour, I used only 1/3 cup of water as well.) To keep them soft I usually place the tortillas between two plates. I place the first tortilla on the plate and place the second plate on top but upside down so that the tortillas are kept from fresh air. Then I stack the other tortillas on top of the first and always put the plate back on. This works much better than a towel and you can save energy and resources by not using aluminum foil. 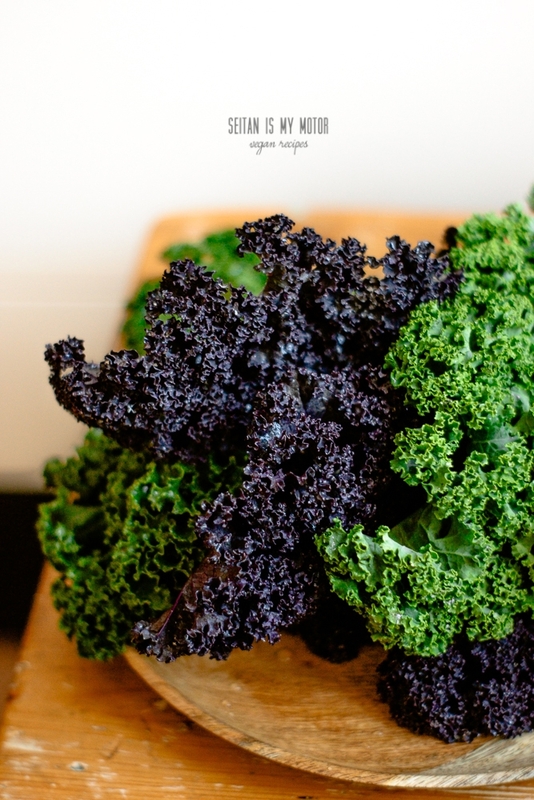 Make your kale pulp as described above. In a bowl, combine flour, salt, and baling powder. Add coconut oil and use your hands to work it into the flour really well. You are looking for a crumbly dough with no lumps of fat left. Add kale pulp and water. (Start with 1/3 cup water and add more if needed) You'll want a firm but pliable dough. Divide the dough into 8 equally sized pieces. Roll out until the tortillas are approximately 7 inches (a little les than 18 cm) in diameter. Cook the tortilla on each side for about 1 to 2 minutes. Place on a plate and cover with a second plate upside down. These look incredible! Such a beautiful colour. 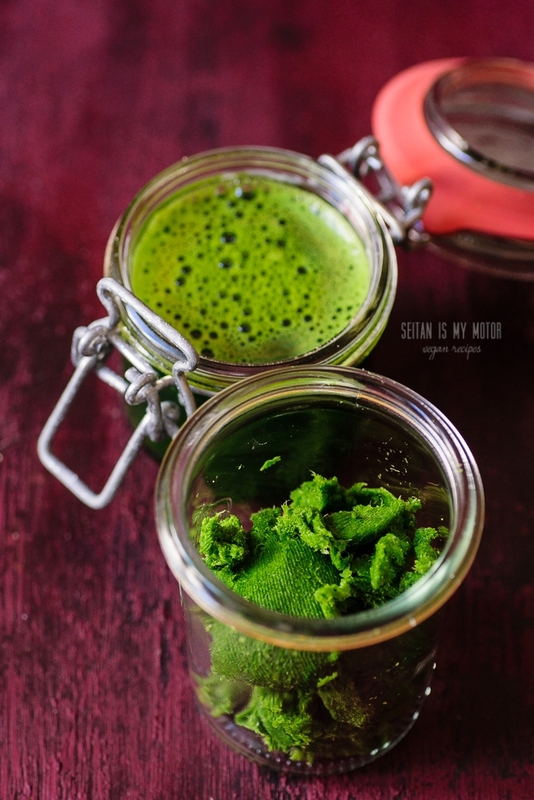 Wow that colour is brilliant – this is the sort of thing I would love to make but it is not always welcomed for sharing in the house – not that I don’t want it all to myself – and good to see your juicing method – I don’t have room to justify an expensive juicer! There’s not much kale taste, if that is your concern. My daugher loved these. 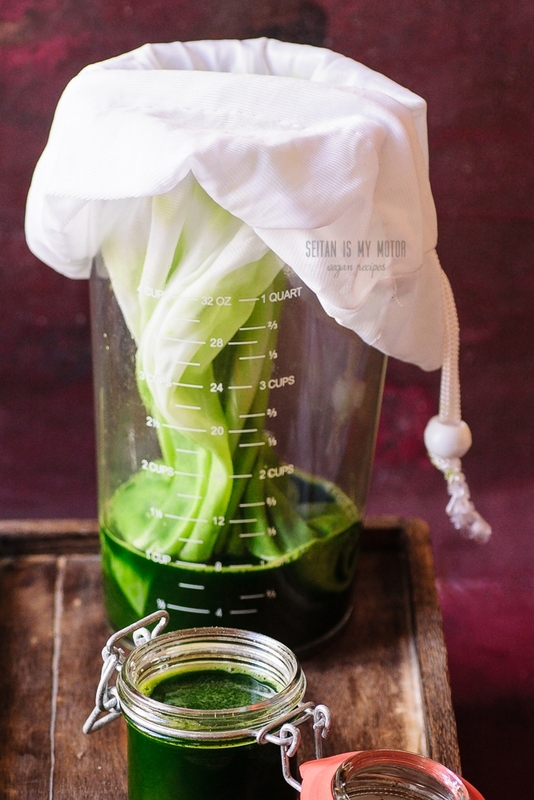 I just love that photo of the vibrant green juice in the laundry bag — so pretty.